THE GUEST begins with Afghan war veteran David Collins (Dan Stevens, Matthew Crawley on the first few seasons of “Downton Abbey”) showing up at the home of the Peterson family. He claims to have served with their deceased son, Caleb, who asked David to check in on his family before he died. David quickly ingratiates himself with the grief stricken Mrs. Peterson (Sheila Kelley), who offers to let him stay for a while. Dad (Spencer Peterson) seems a bit less sure about the idea, but he's too caught up with problems at work and his drinking to put up much of a fight. The kids are split as well, with Caleb's younger brother Luke (Brendan Meyer) seeing David as a surrogate big brother, while Anna (Malka Monroe) doesn't entirely buy his act. At first, David seems to be making good on his alleged promise, helping Luke deal with bullies at school and teaching the boy self defense. Eventually his charm even gets through to Anna, who offers to make him a mix CD. Soon, though, red flags (and bodies) start piling up, and Anna's suspicions return. Anna calls the local military base to see what they have to say about David and gets some disturbing news. The call also activates a private sector special forces team led by Major Carver (Lance Reddick) who set out to retrieve David one way or another. It all leads to a suspenseful final showdown at Luke and Anna's high school, which has been decked out as a haunted house for Halloween. There's obviously some political commentary on the military-industrial complex and the Afghanistan and Iraq wars here. It's pretty standard issue stuff about the sordid things our government and its private sector partners will do in the name of security and profit, respectively, but it adds a little thematic weight to the film. Even without it that subtext, though, this would be a first rate thriller. 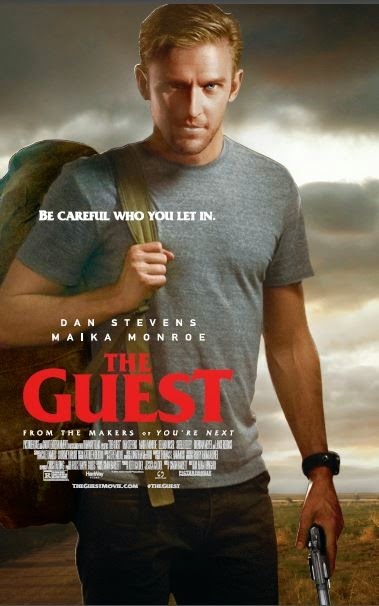 Directed by Adam (YOU'RE NEXT) Wingard and Written by Simon Barrett, in many ways, THE GUEST is cut from the same cloth as such late 80s/early nineties “not a horror movie” horror movies (readers of “Fangoria” know what I mean) as THE STEPFATHER, THE HAND THAT ROCKS THE CRADLE, and UNLAWFUL ENTRY. As in those films, here we have an initially charming character whose mask of normalcy quickly cracks, eventually leading to murder and mayhem. The same formula was also revisited by this year's J-Lo vehicle THE BOY NEXT DOOR but with considerably lesser results. There's also a strong undercurrent of John Carpenter worship going on here, from the Halloween setting to the ominous synth score by Steve Moore (one half of the band Zombi). If you pay attention you can also catch a few shots here and there paying homage to Carpenter's holiday themed masterpiece HALLOWEEN without being too obvious about it. There's also a touch of UNIVERSAL SOLDIER in the film's psychotic super-solider David. Sure the film is more than a little preposterous at times, but then that's half the fun with this kind of movie. In the end it all works thanks to Wingard's strong direction and a great central performance from Stevens. Not quite a masterpiece, but hugely entertaining nonetheless. 3 out of 4 stars.